Exercising is something that people expect you to do, but don’t tell you how to fit it in your busy schedule. Between work, kids, and (possibly) even school, it is hard to find time to get in any exercise for most people. Where do most people find the time to get in exercise? 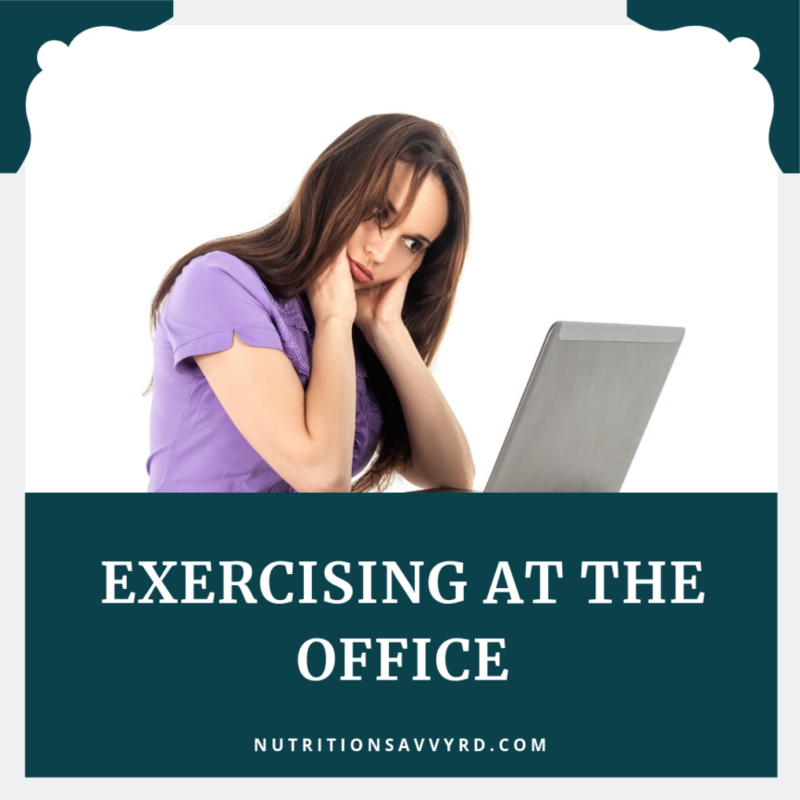 While I may be in the health industry and work to help people lose weight, I struggle to get up and do any exercise while at work because I sit behind a desk all day. 9 hours of my daily life goes to sitting down. That’s a lot of time. The best way to fit exercise in when you have a “desk” job is to find ways to fit it into your everyday schedule. Bring a small weight to work so you can do different exercises when you get a little break. Take the long way to the bathroom instead of going straight to the bathroom in the shortest distance. 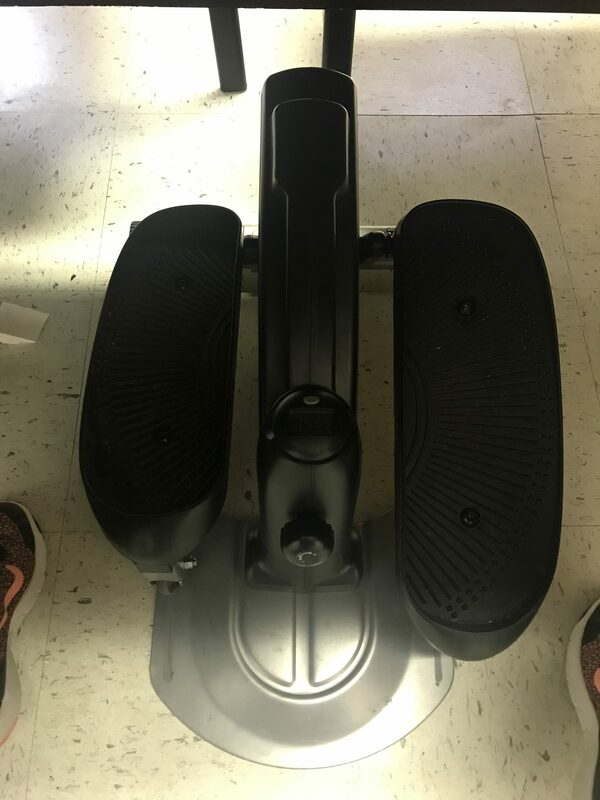 Buy an under the desk elliptical. Use a balance ball chair instead of a regular one. All of these things are minor but can help you get exercise in when you are sitting at your desk all day. The ultimate goal is to get active even while at your desk and at work that way you aren’t just staying still for 9 hours out of your day. Times that are best to exercise during your workday can be when you have caught up on all of your work or if you get two fifteen minute breaks plus a lunch. You can use the fifteen minute breaks to do some of the following exercises or take 30 minutes of your lunch and go exercise if you have an hour long lunch. Most places have a gym close by if you don’t want to exercise at your desk and that will give you the chance to get your workout in without ever having to wake up super early or exercise really late at night. Desk Push-up: This may seem like it is a waste of time, but it can really help get you moving, especially if you are limited on space in your work area. You are still at an angle when you are doing the push-up, but it helps build the muscles in your arms and back. Do two sets of 10 to start off or fit it in when you have a break. 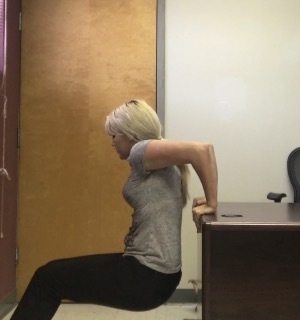 Tricep Dips: Start on any portion of your desk with your hand behind you at a 90 degree angle and dip down. Repeat 10 times and repeat for 2-3 reps.
Squats: No equipment needed for this one! I’d just make sure you don’t have super tight clothing on or a dress/skirt! This is a traditional squat with feet shoulder-width apart and go down as if you are sitting in a chair. Do not let your knees go past your toes for this though. Repeat 10-15 times and 2 sets of this. Leg Lifts: This can be done while sitting at desk and you just slowly lift each leg while tightening your core. I usually do about 15 lifts per leg and then repeat 2-3 times. Biceps Curl: This is when that weight that you’ve left at work comes in handy. Hold your hand palm up with your weight (I use 8 lb at work) and slowly lift up. Repeat 10 times and switch arms. Repeat 2 times. A new purchase of mine that I got on clearance for around $35 is an under-the-desk elliptical machine. It is an amazing little machine that makes you feel like you are on an elliptical at the gym. You can adjust the resistance and it can even be used standing up. There are some fancier ones out there that have attached resistance bands on it for arm exercises as well! This is an item that I really recommend if you sit at a desk all day. Any questions or comments – leave them below!